It's been a long time since you've heard from me. I've been quietly tatting and processing life. Finding it difficult to figure out what to say and how to say it, I know we have lost a wonderful woman in the tatting world. 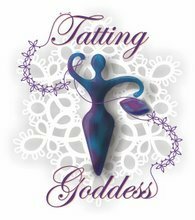 This then is a small tribute to the Tatting Goddess, Gina. Never having met her, it was a uniquely vicarious loss. She was a wonderful presence in this cyber world and always supportive in her comments. All the way to her end here on this earth she was so very supportive and kind. So, Rest In Peace dear, Gina! You will be missed. I'm working on a baby bonnet....and of course, I'm not following anybody's pattern. I am using a couple patterns published out there for the base of the work. You may recognize the 'Down the Garden Path' by Pam Palmer as well as pattern #50 from the Catherine Austin book "A New Twist on Tatting". I'm combining the patterns to create the top of the bonnet. I will then create something for the back of the bonnet. I hope to begin that part later tomorrow or later in the week. I may have several questions as I approach the back. I'll check back in and keep you posted on the progress. Until then, please be safe and treat yourself with respect! !